The last few New Year’s Eves, we’ve taken the looong drive out to the northwestern suburbs to visit Mitsuwa Japanese Marketplace, which has everything Japanese that you never knew you needed and have no idea what it is, but you really, really want. Mitsuwa is like a busy little village inside. In addition to the grocery, there is a video store, a food court with six or seven different restaurants, a beauty parlor, a Shiseido boutique, a liquor store, a pastry shop, a travel agency, a bookstore, even a music institute. All geared to Japanese clientele, or the Japanese culture lover. Let me start by saying that, sadly, I have but the slightest knowledge or understanding of Japanese culture. I did work as a ‘hostess’ in a traditional Japanese club in New York City (Club Shige, now defunct) in 1986-87, arigatou gozaimasu ありがとうございます. Shige-san and his very mean wife paid us college girls from Fashion Institute of Technology $10/hour to pour Suntory whiskey and giggle at jokes in a language we did not understand, all while singing to the Japanese men accompanied by Shige-san on the piano. It was an awesome gig, back in the day. I even learned a bit of Japanese which I still use to impress (?) my students today. That said, my knowledge of Japanese cuisine is just as embarrassing as my geisha girl past. But I do enjoy making sushi- mostly nigiri (fish and vinegared rice) and maki (fish, vinegared rice, some veggies/toppings wrapped in nori). 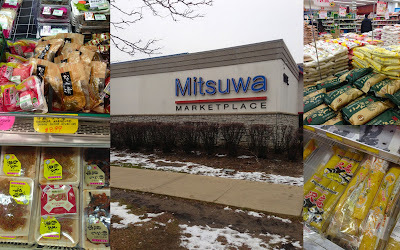 I love Mitsuwa because it has the freshest sushi-grade seafood that one can get in the Midwest. Whenever I am at the fish counter, I feel like I am waiting for my luggage at the baggage claim at O’Hare...people are jumping in front of you and grabbing at whatever they can get. As the chefs are butchering and wrapping the fish, the people are literally snatching it off of the ice as fast as the chefs put it down. 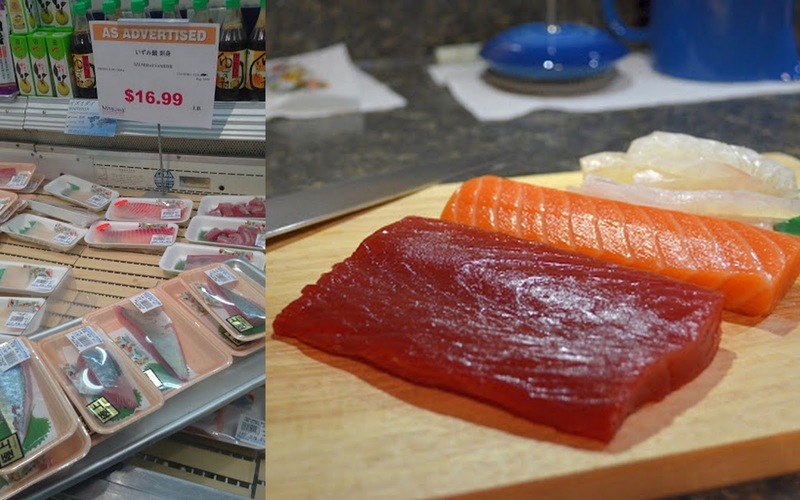 On New Year’s Eve, we were quick enough to get some lovely Yellow-fin Tuna, Salmon, and Red Snapper. Cook the sushi rice in a rice cooker or on the stove top according to directions. When finished, put the rice in a stainless steel bowl. Using a wooden spoon or paddle, toss with seasoned rice vinegar (the amount of vinegar will vary, but I usually use about 1/2 cup for 3 cups of cooked rice). Set aside to cool to room temperature. While the rice is cooling, remove your fish from the refrigerator and slice it into long, thin strips. Keep the fish in the refrigerator when not working with it. Place a piece of nori on the bamboo mat. Using your fingers (wet them with water so the rice won’t stick), press a thin layer of cooled rice onto the nori, leaving a border of about 1/4” around the sides. If you’d like a crunchier roll, sprinkle the rice with sesame seeds. Starting at the edge nearest you, place a strip of fresh fish. Top with some julienne vegetables and/or other toppings. You may also add some wasabi or wasabi mayonnaise at this point, if desired. Go lightly on the toppings...it will be easier to roll and tastier, too. Lift the mat’s edge and begin to slowly and firmly roll the sushi. When the roll is finished, the seam should be on the bottom. Using a very sharp slicing knife, cut the roll into 1/2” rounds, and place on a platter. Maki dries out quickly, and should be eaten immediately for the best results. Serve with pickled ginger, soy, and wasabi.